CONNECTORS: [GND,OFF#] for power supply control; [D0,D1,D2,D3] for gpio (2 for pot control switches); TP2 for gpio, [SC2,+5,GND,SD2] for secondary I2C bus, [IO Exp1, IO Exp2] for 32 gpios using primary I2C bus; [PWM,DIR,DIS] for motor driver(s); [A,B,Z,+5,GND] for motor encoder(s); [+5,GND,VOUT] for current sensor(s); [F+, F-] for fan(s), or relay(s), or whatever; [AN0..AN5] for analog inputs (2 for pot controls); [EX0..EX3]for external interrupts (3 for R/C controls); [SC1,+5,GND,SD1] for primary I2C bus; [GND,VBATT] for power connections; COMM for standard RS232 serial link; [JP1,JP2] for COMM2 (RS232 or logic levels); ICD for code development and real time debugging. Of course, most people won't use all of these connections, but if you need additional functionality, they are there! Dual open loop, PWM motor controls via R/C, Pots, or Serial Interfaces. Dual closed loop PWM motor (positional and velocity) via Serial Interfaces. PID and Trajectory Generator employed for smooth velocity ramping in closed loop controls. Standard quadrature encoder inputs (2 motors) provide motor position and velocity feedback. Analog motor position feedback supported for some applications. Digitally adjustable voltage windows and interrupt handlers for fast over current response when used with off board current sensors. Support for PID “Tuning” via data capture using the “Step Response Command”. Adjustable Slew Rate for all motor control methods. Serial EEPROM (64K bytes) as well as internal EEPROM (1K bytes) for non-volatile storage. Parameter Block in EEPROM for easy customization of motor characteristics, operating mode, etc. Built in three channel R/C interface with optional mixing. Two built in open loop potentiometer motor control methods. 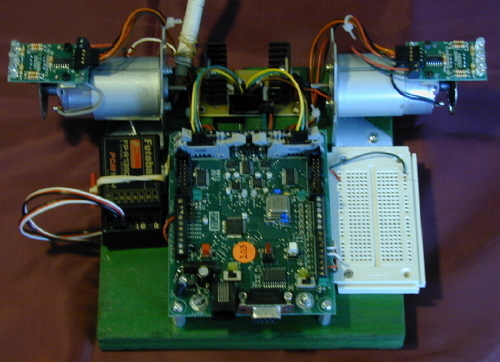 Giant Servo Modes (postion, closed loop) using either Pot or R/C inputs. Terminal Emulator command line monitor using RS232 Channel 1. API command and monitor Interface using RS232 Channel 1 for use by a “smart” PC Application. I2C (SLAVE) command and monitor Interface using second I2C Bus. Features interrupt driven for efficiency. Robust 5V power supply, with external On/Off switch, provides ample power for BEC. RTC for timing and scheduling. Both primary and secondary I2C buses routed to connectors for off board use. Second RS232 interface (Channel 2; currently unused) routed to header. Firmware is updatable via a boot block loader using a serial cable to a PC. 2) Provided files (main.c, dalf.lib). 4) Lots of unused memory both in FLASH and RAM. 5) Lots of unused I/O. A couple of motor/encoder combos (CPR=20), a dual motor driver, an R/C receiver, and a small breadboard for LED's, switches, pots, or whatever. The receiver antennae is shown in the background wrapped around a pencil (very professional!). When driven with +12V the motors have a maximum RPM of about 4,000. The motor/encoder combo units (also gear reduction assemblies) are available from the Website of Electric Vehicle Corp. (alias the "Encoder Geek"). 12V geared PMDC wheelchair motors paired with US Digital incremental encoders (CPR=64) provide quadrature signals for position and velocity control. Also shown are two OSMC Motor Drivers with cooling fans. The motors are over-driven with an 18V supply for a maximum RPM of about 360. Not shown is an additional 3.6:1, belt driven, gear reduction assembly that drives the 10" wheels. 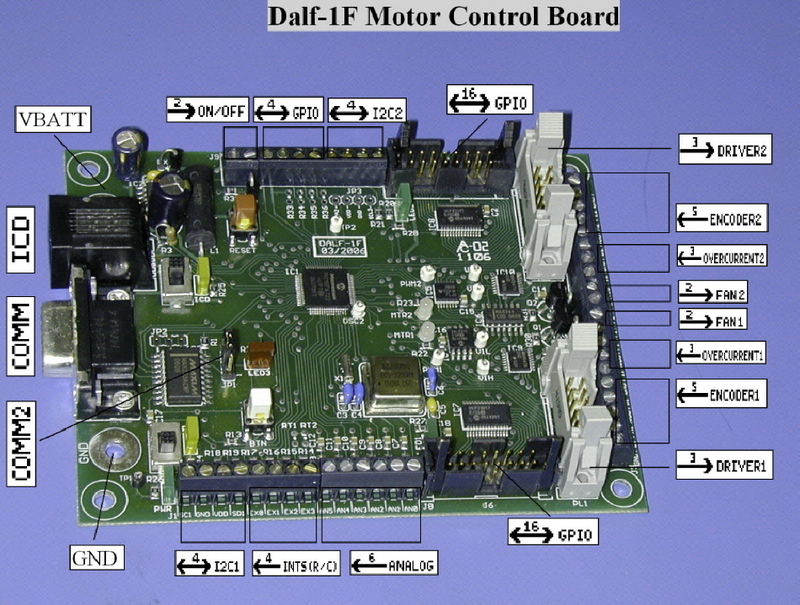 The Dalf Motor Controller and OSMC Motor Drivers are available from the Website of Robot Power, Inc.